» College Football Identity Crisis: Can Charlie Strong Save Texas From Turning Into the No-Star State? College Football Identity Crisis: Can Charlie Strong Save Texas From Turning Into the No-Star State? I live in Austin, Texas, epicenter of the insatiable statewide obsession that is Longhorns football, and for the past six months I’ve asked every UT fan I’ve encountered what should be an easy question: Who’s the best player on Texas’s roster entering the 2015 season? In most years, the answer would be a no-brainer, or else a close call between a handful of immediately recognizable candidates. The Longhorns are the biggest game in town, and no one who flashes any hint of next-big-thing potential manages to fly under the radar. This year, though, it’s like watching contestants seize up during an especially arcane round of “Final Jeopardy.” They start to answer, then stop, mentally scanning the lineup to place who’ll be back and who won’t, until it dawns on them that there is no good answer. It’s not a trick question, although after scanning the preliminary 2015 depth chart, it’s not surprising that it might feel like one. Last year’s biggest star, defensive tackle Malcom Brown, is now in the NFL, and there’s no clear program poster boy in his absence. When I brought up my unscientific survey to second-year coach Charlie Strong, he laughed in recognition. “What do they say?” he wanted to know. Well, coach, they don’t really say anything; they just tend to sober up a little faster than usual. Obligingly, Strong was the first respondent to supply a concrete answer: senior tailback Johnathan Gray, who arrived as the top-rated back in the 2012 recruiting class and expects to be at full speed in the fall after battling injuries the past two years. (Gray also figures to have the starting job to himself in 2015 after three seasons of splitting carries with the departed Malcolm Brown, not to be confused with the aforementioned Malcom.) Even with Strong’s endorsement, though, no one is about to argue that Gray is on the verge of joining the venerated likes of Ricky Williams or Cedric Benson, and at any rate the implications of the question are far more telling than the answer: At a school that expects to have its pick of top talent in the most resource-rich, football-obsessed state in the union, why does that talent suddenly seem to be in such short supply? This exercise isn’t academic: In these parts, the lack of star power is a direct affront to the venerable tradition of Texas Exceptionalism. It’s no secret that UT fans have a reputation for entitlement and, more importantly where Strong is concerned, impatience. And while that may be a slightly exaggerated picture of the fan base as a whole, it’s an accurate description of the segment whose opinion matters most: the deep-pocketed alums whose largesse makes luxury boxes, private planes, and multimillion-dollar coaches’ salaries possible, and who have little interest in waiting to enjoy a return on their investment. Until last year, Texas routinely ranked as the richest athletic department in the nation, and it spent more on its athletes in 2014 than any other school. It’s the only school that boasts its own cable channel devoted almost exclusively to sports — the Longhorn Network is probably faring a little better than you may have heard — and one of the very few that isn’t merely puffing itself up when it says it expects to compete for championships on an annual basis. Fed up with diminishing returns under Mack Brown, architect of more career victories at Texas than any other coach except the one whose name is on the stadium, a small clique of UT boosters reportedly launched a quixotic pursuit of Nick Saban in December 2012, a full year before they finally succeeded in shoving Brown onto an ice floe amid full-blown Saban-to-Texas hysteria. Why, they wonder, should Texas settle for anything less than the best? It also cemented a losing record, a regression even from the mediocrity of Brown’s final seasons, and only the ninth sub-.500 campaign for Texas since World War II. The architects of the other eight were all fired or forced out in short order. Without a tangible step forward in Year 2, there won’t be any avoiding the speculation over whether Strong will be next. While Strong’s mandate for improvement is clear, his specific vision for this particular lineup is much less so, which might say more about the lineup than it does about Strong. Although Texas remains far and away the dominant recruiting power in the conference, the actual on-field returns over the past five years have fallen so far short of expectations that Brown, whose unwavering grip on the state’s top recruits earned him the double-edged nickname “Coach February,” was getting more attention at the end of his tenure for some of the nearby products he reportedly overlooked — see: Andrew Luck, Robert Griffin III, Johnny Manziel, et al. — than for any of the ones he actually hooked. The result: With members of Brown’s final signing classes now populating the starting lineup, the casual optimism that would have accompanied their maturation as a matter of course a few years ago is now accompanied by several pounds of salt. So while the lineup still consists almost exclusively of players who were once touted as four- and five-star prospects, there’s a weird void in the usual template for setting expectations: Beyond the fact that there are no proven headliners among the older players, there are also somehow no obvious heirs apparent among the underclassmen. The sense of forward momentum that Strong is striving to achieve has been almost entirely divorced from the baseline of raw talent. Nowhere has that effect been more obvious over the years than at quarterback, where the depth chart since Colt McCoy’s graduation in 2010 has looked more like a revolving door. 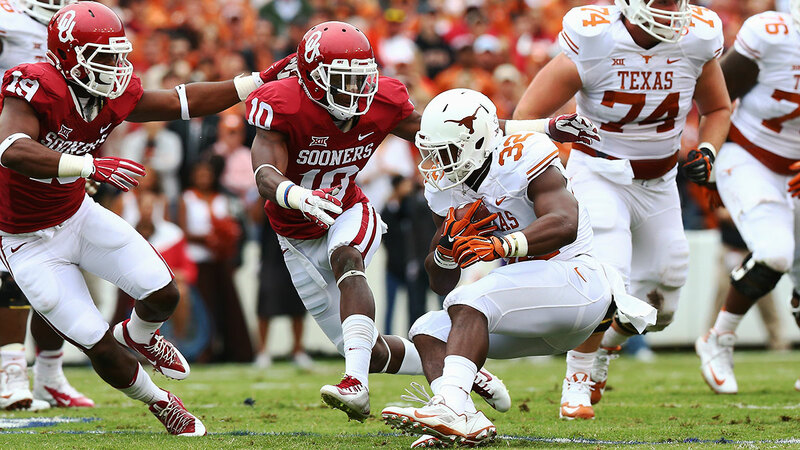 The incumbent starter entering preseason camp, junior Tyrone Swoopes, was the Big 12’s least efficient passer against FBS defenses in 2014, and looked so lost by the end of the season that coaches made an unabashed push in January to sign five-star prodigy Kyler Murray to serve as Swoopes’s immediate replacement. (To no avail: Murray never wavered from his commitment to sign with Texas A&M.) The Longhorns are stuck with Swoopes,4 and they’re also stuck with an offensive line that never quite recovered last year from an early spasm of injuries and attrition, and with a receiving corps whose members have combined for all of six career touchdowns. Until proved otherwise, the only argument that things are going to get better on that side of the ball is that they can’t get much worse. Defensively, the outlook is less grim: Texas more than held its own statistically in terms of total defense (first in the Big 12 versus FBS opponents), scoring defense (tied for second), and Defensive S&P+ (third). Even when the Longhorns yielded 40-plus points, to BYU, Iowa State, and TCU, it was largely a result of pace5 and/or giveaways by the offense,6 not of a wholesale defensive collapse. Strong’s background is on the defensive side: He boasts two national championship rings as the coordinator of a succession of nasty Florida defenses under Urban Meyer, and his final defense at Louisville led the nation in both yards and points allowed in 2013. Meanwhile, his first two recruiting classes at Louisville, in 2010 and 2011, produced nine defensive draft picks over the past two years. Almost everyone in that group started out in college as an obscure, three-star recruit; there’s no reason to think Strong won’t be able to do the same for more touted guys like Thomas, or junior defensive tackle Hassan Ridgeway, or freshman linebacker Malik Jefferson. Still, the problem that lingered throughout the end of Brown’s tenure persists as emphatically as ever, and ties directly to the absence of above-the-fold playmakers: an utter lack of consistency or identity on offense. 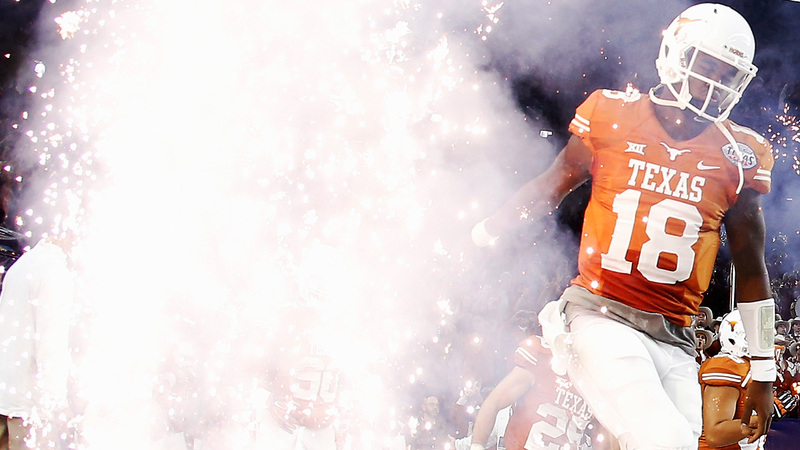 At its best, Texas’s offense under Brown was engineered around its stars. When the Longhorns had Williams and Benson in the backfield, they leaned heavily on a straight-ahead power-rushing attack that called on the resident workhorse to log 25 to 30 carries per game. When they had Vince Young, the answer was to spread the field to create running lanes for the quarterback against isolated, overmatched defenders. When the torch passed to McCoy, they occasionally abandoned the notion of a conventional ground game altogether in favor of letting him pick apart defenses with his uncanny accuracy. From that point on, though, the well of reliable playmakers has run as dry as the hill country brush. The system has been passed from the hands of four different coordinators in five years, along with a playbook that sometimes seems to be in perpetual revision. Whether it’s a cause of UT’s offensive rut or merely an effect, the absence of anyone who could even plausibly pretend to deserve a feature role over the past five years may be the single most telling symptom of the Longhorns’ decline. At some point, the lack of a coherent identity is the identity. Strong’s top priority in 2015 is to figure out a way to change that while fielding effectively the same cast that failed to escape the rut in 2014, including assistant offensive coach and playcaller Shawn Watson. In the spring, that meant emphasizing a more aggressive tempo and simplifying play calls to facilitate the faster pace, a formula we’ve heard on more than one occasion in the recent past. What it will mean on September 5, when the Longhorns open at Notre Dame, remains anyone’s guess. But if they’re still guessing after that, no one will be able to blame the locals for bracing against another year of the same. If you believe the rumors, Saban was offered a package worth up to $100 million, including a proposed signing bonus in the neighborhood of $12 million to $15 million; instead, he settled for a contract extension at Alabama that raised his salary to $6.9 million per year. McCombs had his heart set on Jon Gruden, going so far as to lobby Gruden personally even though he wasn’t part of the official search committee. McCombs later apologized for those remarks, partly in response to charges of racism. This is the point at which certain Texas fans will begin shouting “Jerrod Heard!” in accordance with the old proverb about the backup quarterback being the most popular player on the team. But despite Swoopes’s struggles, Heard never set foot on the field last year as a true freshman, failed to overtake Swoopes in spring practice, and will open preseason camp running with the second string. So far, whatever the pro-Heard faction sees in him — aside from the fact that he isn’t Swoopes — seems to have been lost on the coaches. BYU ran 88 plays; Iowa State got off 93. Texas committed six turnovers against TCU, two of which went directly for Horned Frogs touchdowns; two others set up the Frogs for short touchdown drives inside the UT 20-yard line.